Above: Art's Motel in Farmersville, Illinois. 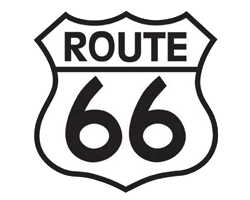 Motels: this is one of the best deals on "Route 66". Even if many had to close shop after decommissioning, others continue to welcome visitors in an atmosphere of times past. Some of them are quite legendary. 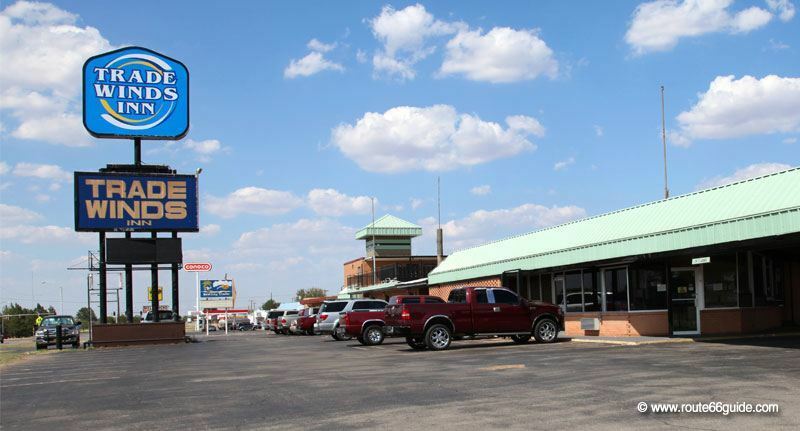 Motel, a word standing for "motor" and "hotel" combined, appears along Route 66 in Miami, Oklahoma, as the "Riviera Courts", the first motorist hotel, opened its doors. It will be quickly emulated along the transcontinental route for which it was designed, fully committed to the automobile. Above: Villa Ridge, Missouri. 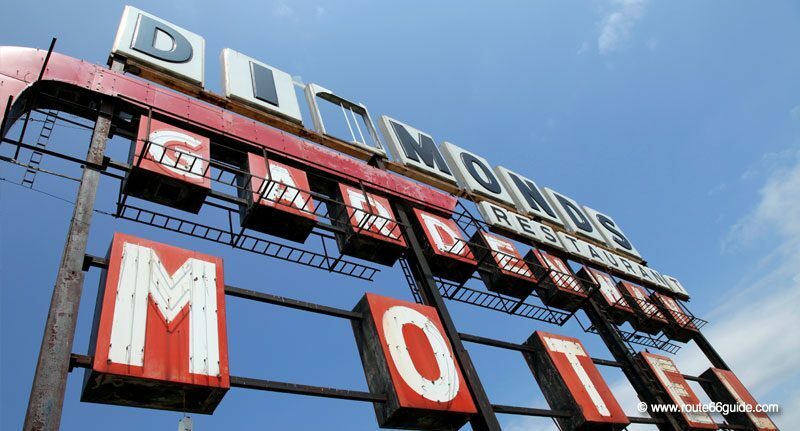 Ghost-sign of Diamonds Restaurant and Gardenway Motel. Motels were designed from the ground-up to minimize walking distances; usually located next to the busiest areas, guests park directly across the reception to book the night and then drive over to the parking space in front of their rooms. Thus, motels will rarely have more than one floor, usually featuring a U-shape setup, around long rows of parking spaces. 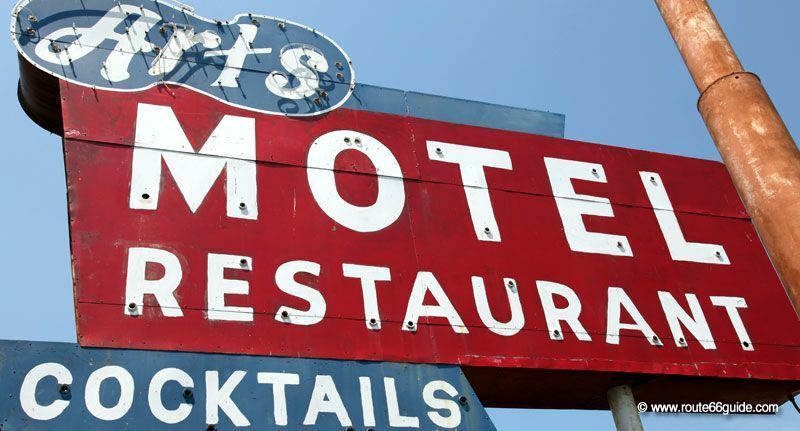 In the heyday of Route 66, some motels diversified to become tourist courts, which offered a multitude of ancillary services, restaurant, bar, garage, service station, etc. 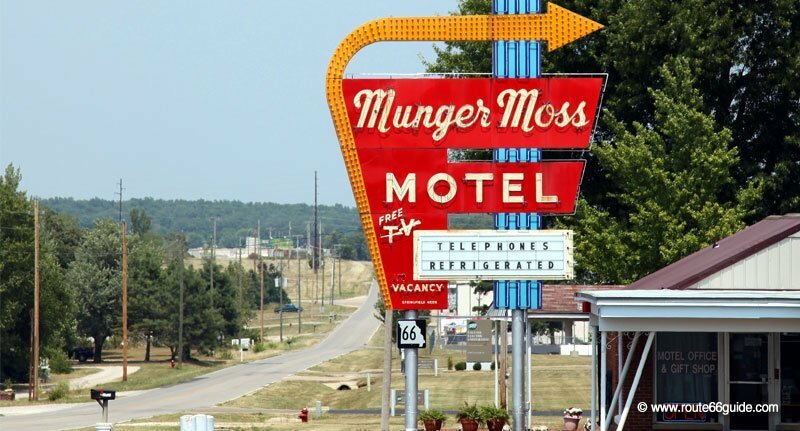 Above: Munger Moss Motel. Lebanon, Missouri. This establishment, still in operation, ranks among the most legendary along the historic route. Its giant billboard is an icon of Route 66. But ... beware! 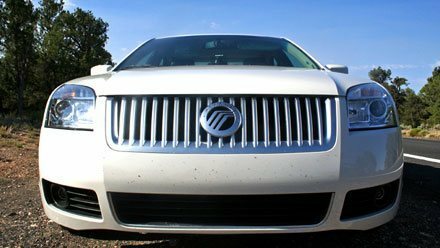 Some travelers have endured bad experiences at some “weary” motels, fighting against dust, moisture, barely functioning equipment and ... fending off feisty cockroaches! 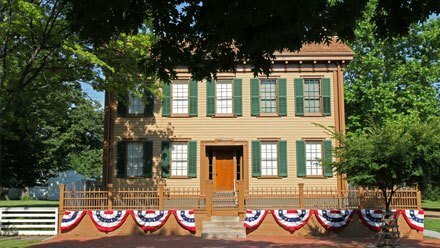 It seems clear that many historical establishments, perhaps under the pretext of maintaining a vintage atmosphere, are avoiding a much needed renovation. We also came across ravishing surprises. 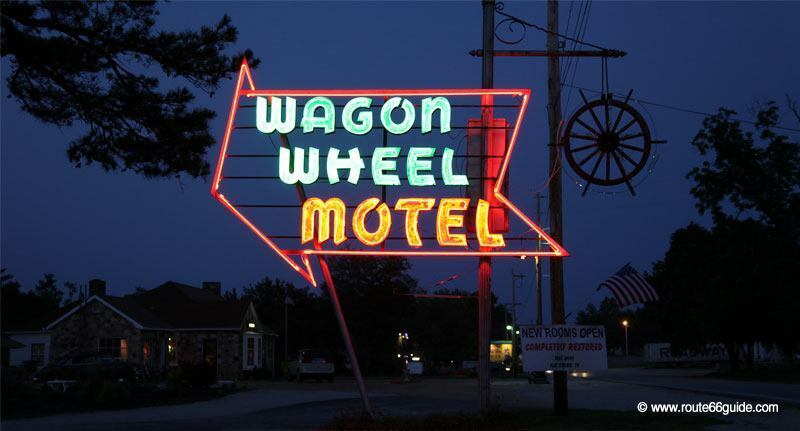 In particular, we have soft spot for the marvelous "Wagon Wheel Motel" in Cuba, Missouri, an all-time icon of Route 66. 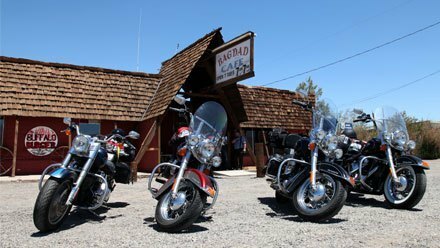 It was recently purchased and entirely renovated by a resident of the small "Murals" town, staying true to the history of this former tourist court, which represented an unavoidable stage for Route 66 travelers. Travelers are naturally drawn by its beautiful neon sign, flashing along the historic route throughout the night. Above: Wagon Wheel Motel. Cuba, Missouri. The historic motel was bought and renovated by a Cuba resident. This former tourist court was a popular stop for Route 66 travelers. 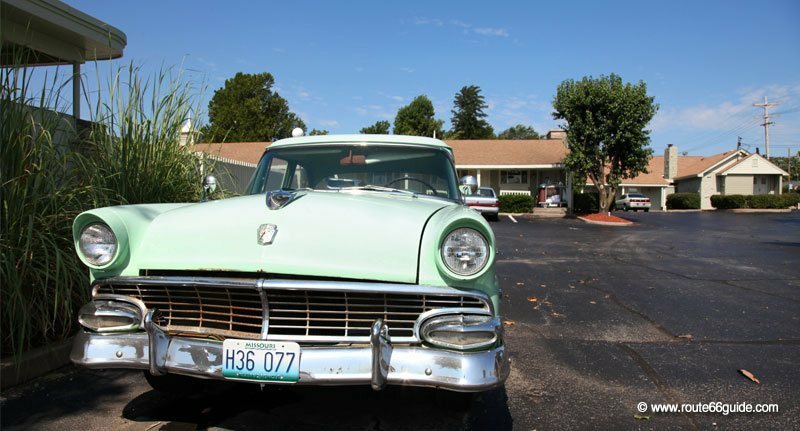 AAA, the legendary and renowned association of hotel rating and car repair, declared it one of the best motels in Missouri. Its rooms, housed in small cabins sprawling out onto a large garden area, are beautifully decorated and equipped with modern amenities. 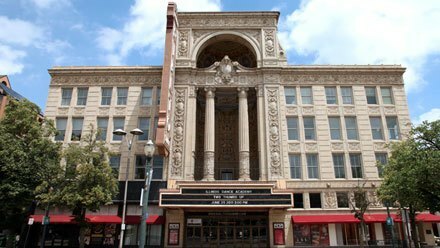 $60 for a double room, $100 for a suite with Jacuzzi or massage shower. Above: The Wagon Wheel Motel in Cuba and its pretty booths of local stone along Route 66 remain unchanged since the early days of the transcontinental road. Its mythical badge is shaped as a wooden chariot wheel. 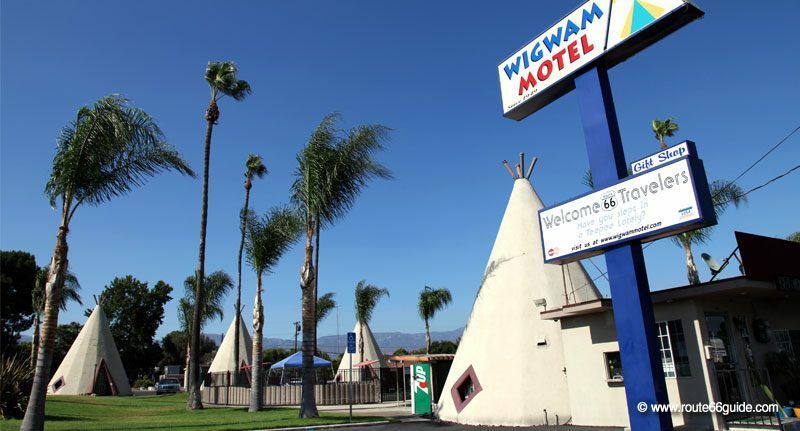 During the wild years of Route 66, the "WigWam" motel chain raised many eyebrows and rightly so. At the time, the chain run ten establishments distributed along the transcontinental route, and offered rooms housed in hard-fabric teepees, around a mischievous and provocative slogan: "Do it in a teepee”. Again, everything was arranged so guests park across their rooms. Sadly enough, few of them have survived the disappearance of Route 66. The last two teepee-motels are still in service in Arizona (Holbrook) and California (Rialto). Above: Rialto, California. WigWam Motel (Teepees). The second WigWam motel, still open to the public, is located in Holbrook, Arizona. Also mythical are the many hotels and motels that hosted some of the greatest personalities of those crazy days. 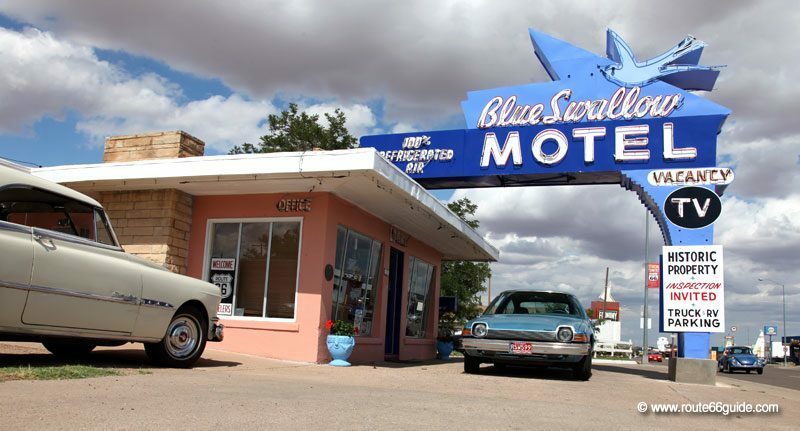 Several motels and hotels on Route 66 claim to have hosted Elvis Presley. 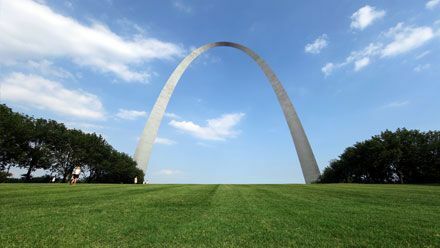 Such is the case of the Best Western Route 66 Rail Haven in Springfield, Missouri. 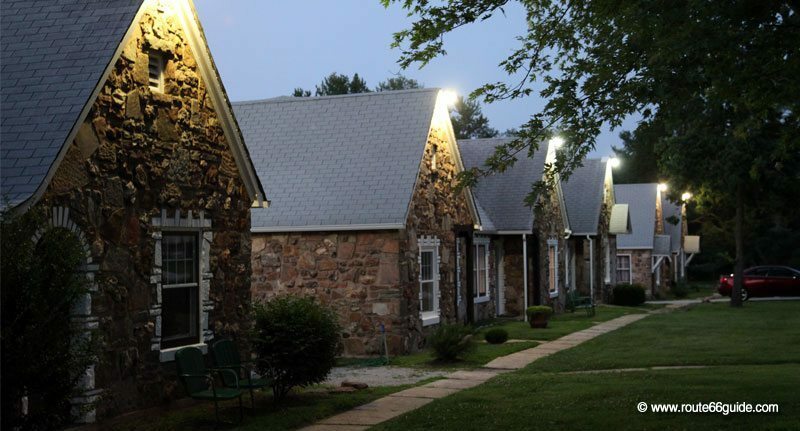 Entered in the National Register of Historic Buildings, the establishment offers light wood "cottage-cabins", in an U-shape setup as customary, and proclaims in a giant billboard along the road: "Elvis Presley stayed here"; it was in 1956. Above: Best Western Route 66 Rail Haven in Springfield, Missouri. 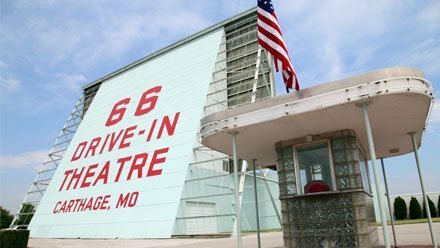 It is located on Route 66 since 1938 and hosted the "King" himself! It may not look like much and yet ... the King was apparently a regular at the Trade Winds Motel in Clinton, Oklahoma, where he repeatedly stayed in room 215, one you can still book today. Above: Trade Winds Motel. Clinton, Oklahoma. 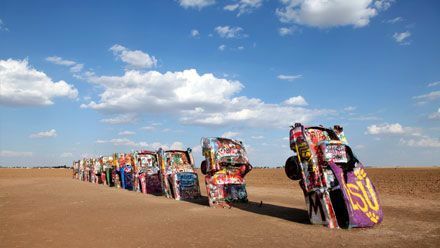 It is located across the fantastic Route 66 Museum. In the footsteps of other celebrities from the golden age of the cinema, we head towards "El Rancho" hotel in Gallup, New Mexico, once a sort of Hollywood studios branch. 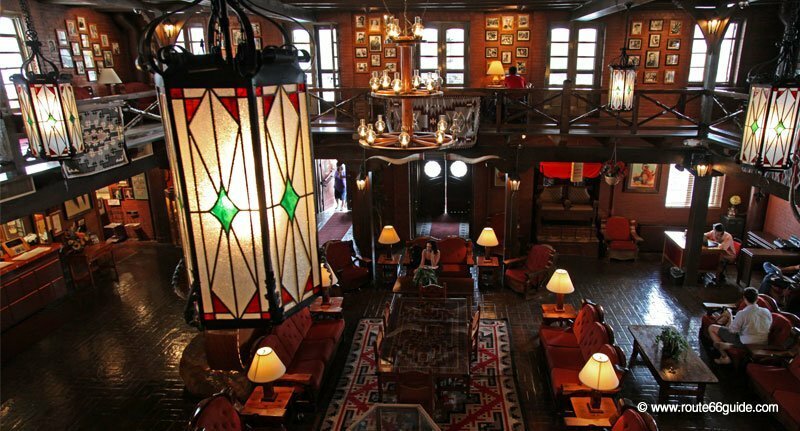 The autographed portraits of the greatest actors and actresses ornate the walls of the magnificent hotel lobby, basking in a serene, warm atmosphere framed by dark wood and wide, protruding beams. Above: El Rancho Hotel & Motel, The jewel of Gallup, New Mexico. The walls of the hall are covered with dozens of autographed portraits of the greatest movie stars of the twentieth century. Other establishments are even older. 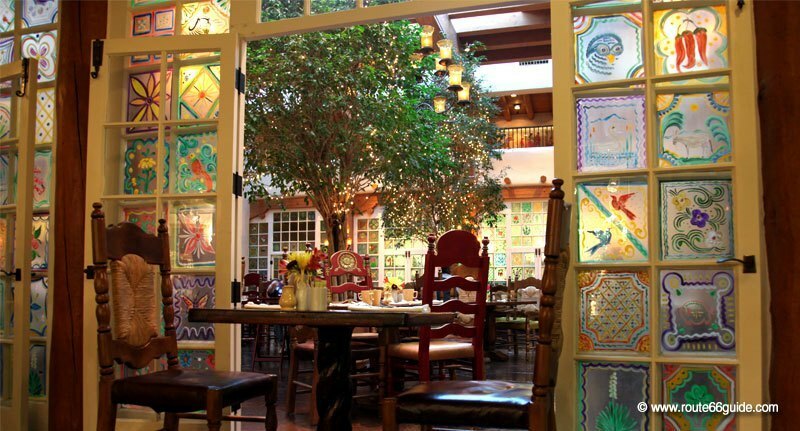 The best example is "La Fonda Hotel" in the delightful town of Santa Fe, perched at an altitude of 7,260 ft amid the high mountains of New Mexico. The city is the oldest city in the west and "La Fonda", probably the oldest hotel in the United States. Above: La Fonda Hotel in Santa Fe, New Mexico.